I’ve written from time to time about GPS devices and ways of geocoding photos. Now I’m going to talk about a software tool to help in managing the GPS data files (usually recorded as GPX files). Adze is software for the Mac, available in Lite (free) and paid versions. It provides a graphical view via a map of the trails in a file. You can split trails, edit points, simplify the route, consolidate multiple logs into one file, etc. I’ve only been using it for a week now, but it’s already proven very useful. 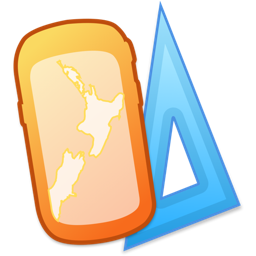 If you’re dealing with GPX files and using OS X, I recommend you check out Adze. I’m now using it as my default GPX viewer/editor. One drawback of the software at the moment is that it always reports location times in your computer’s local timezone, which can be awkward when you’re editing trails recorded on the other side of the globe. But hopefully this niggle will be resolved in the future. The main restriction of the Lite version is that if you save a file it forces you to merge all the trail segments into one continuous stream in the GPX file. The full version doesn’t have that restriction, but if all you want is a GPX viewer Adze Lite will probably serve you well. If you need to convert other GPS log formats (e.g. the NMEA logs produced by some cameras) you should look into GPSBabel to convert them to GPX. Further below I provide a link to software for non-Mac systems. Qstarz BT-Q1000X and Q1000XT loggers. On ship expeditions one of these is usually set up to constantly record the ship’s location. On vehicle based safaris we try to have one mounted in each vehicle. I download the data at least every week or two via a USB cable and the BT747 software. Canon EOS 7D Mark II camera. I have this set so while the internal GPS is enabled it both keeps the camera’s time correct, and it records a log of our trail. Trails can be saved as NMEA log files to a memory card alongside the photos. 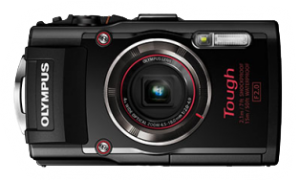 Olympus TG-4 waterproof camera. Like the 7D Mark II I have it set to record a log (and update the clock) if the GPS is enabled. Again trails are saved on-demand as NMEA files to the SD card. On expeditions I usually have this camera in an outside pocket where I can quickly grab it to take photos if a DSLR isn’t handy, plus it’s recording my position even if I’m a long way from the ship (e.g. onshore). Sony AS30V action cam. If the GPS is enabled it keeps the clock in sync and also records a log while any movie is being recorded. 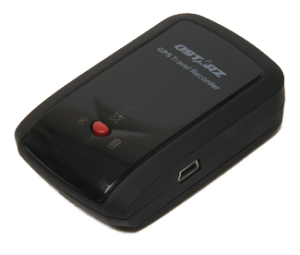 Canon GP-E2 GPS receiver. This connects to the hotshoe of many EOS cameras and can update their clocks and tag photos with locations. 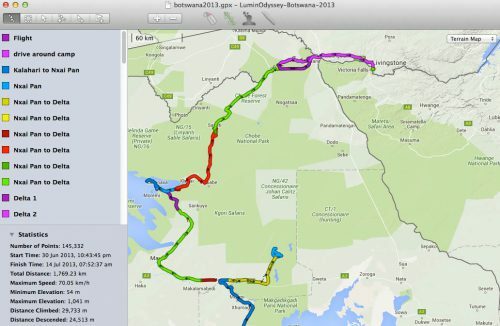 It can also record trail logs internally (which can be downloaded via USB and Canon’s Map Utility program). Mind you, for me its primary use is to update my camera clocks every few days to correct their inevitable drift. 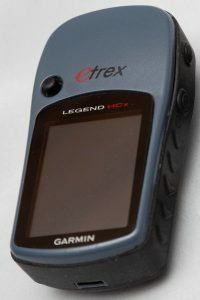 Garmin eTrex Legend HCx GPS. I have this set to record a GPX trail to the microSD card whenever it’s on. I used to use this as my personal logger but that function has largely been taken over by the TG-4. The iPhone GeoTagr app. This is my last resort if I have no other logger. It chews up the phone battery faster than normal, it sometimes thinks you must be on the nearest road even if you’re on a bike or train (this is more iOS’s fault than the app’s, and doesn’t apply when you’re away from civilisation), and if you stop in one location for too long it pauses recording (which can complicate geocoding photos). But it works (I don’t use its geocoding functions, just to record trails). Unlike some logging apps, it even allows me to transfer GPX files to the computer without an Internet connection. That’s a lot of different trails! I never have all of these active at once, but when on expeditions I will often have multiple logs for each day. Sometimes this is multiple downloads from the TG-4, sometimes it’s from multiple devices. Why do I use all these trails? Primarily so I can attach locations to the images from all my cameras (I use Jeffrey Friedl’s Geocoding plugin for Lightroom to do this, rather than Lightroom’s simpler built-in geocoding function). I can draw pretty maps in Google Earth. Also if I’ve been hiking or cycling it’s interesting to examine where (and how high and how fast) I went. Even if I end up stripping the GPS locations from photos as they’re published, it’s immensely useful to have that information available to me when working with my image library. For some sensitive locations I do block out the GPS data, but that’s a separate discussion. After workshop expeditions I also merge some of the logs together to provide an overall trail for each vehicle, which we provide to workshop participants who may not have had their own GPS-enabled devices. Just as we need to have a system for keeping track of all our digital photo files, having a system for keeping track of the GPS data is very important! 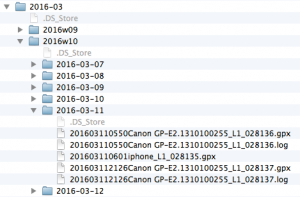 I use a date-based folder structure (the same as I use for my photos, just duplicated under a different “gps” folder) where the start date of the log file automatically determines which folder it will be placed in, and the filename includes a reference to which device recorded the data. This makes it very easy for me to later find the appropriate files, even though the timestamps are in UTC rather than the local timezone. This is automated by the ingest function of my PteroFile software as it downloads files from camera cards, which also converts any camera LOG files to GPX format as it goes, making the download process easy. You don’t necessarily need a system as fancy as this, but you should have some form of system. As I mentioned above, many people use GPSBabel to convert LOG files to GPX. If you’re using another operating system such as Windows or Linux, have a look at this list of GPX resources to see if something there will help you.